Ellingham is a parish on the Norfolk-Suffolk border, on the banks of the River Waveney. It is located between Broome and Geldeston. The village name is Old English and means ‘homestead of Ella or Eli’. The village is mentioned briefly in the Domesday Book suggesting the settlement may have Saxon origins. The village is rather dispersed, and the modern village of Kirby Cane has also now extended into Ellingham parish. Although the documentary sources only stretch back to 1086 when the Domesday Book was written the archaeology of the parish records human activity here from the prehistoric period onwards. The earliest dated find is a Palaeolithic flint handaxe (NHER 10673). There are also other worked flints, including several Neolithic axeheads (NHER 10676, 35910 and 12193). These casual finds suggest that there was human activity in the area, but it is hard to identify any possible areas of settlement. The excavation of a possible prehistoric enclosure and ring ditch (NHER 36050) in the grounds of Ellingham Hall suggests that occupation was concentrated on river terraces by the Waveney. Some of the ditches excavated at the site contained Iron Age pottery. Prehistoric pits (NHER 35938) have also been excavated. Other evidence for prehistoric activity can be seen on aerial photographs including a possible Bronze Age ring barrow (NHER 24983) and another ring ditch and associated linear features (NHER 40646). In the Roman period mortaria, pots with a gritted inside surface used for mixing things, were made at kilns at Dairy Farm. Two have been excavated, and at least one more exists on the site. The kilns were partly made of old broken mortaria. At least five potters worked here, including one called Regalis who moved here from Colchester. The Roman kilns (NHER 11843) are unusual because they seem to be located far away from evidence for other Roman activity. Some Roman ditches (NHER 35938), probably field boundaries, were excavated ahead of the building of the Ellingham bypass. A scatter of Roman objects (NHER 33400) has been found by a metal detectorist. Several Roman coins (NHER 10678) and a Roman brooch (NHER 28990) have also been found. These finds suggest Ellingham was not an area of dense occupation or activity except for the kiln site. There are also very few archaeological records for Saxon finds. A metal detectorist has found an Early Saxon brooch (NHER 33400) in the parish. An Early to Middle Saxon pin (NHER 10679) and a Late Saxon key (NHER 10680) have also been recovered but these are all the archaeological evidence there is for Saxon Ellingham. This is not unusual however, and does not necessarily reflect a lack of activity at this period. It is more likely that archaeologists have simply been looking in the wrong place! During the medieval period St Mary’s Church (NHER 10693) was built in the 13th century and extensively remodelled in the 15th century when all the windows were replaced. Medieval earthworks (NHER 30620) on Geldeston Marshes are indications that there was once medieval settlement here. Building platforms and a small medieval moat have been surveyed and lots of medieval pottery has been found at the site. Medieval boundary ditches (NHER 35938) were excavated in advance of the bypass. There is more surviving evidence from the post medieval period. Ellingham Hall (NHER 12667) was built around 1802, as was its unusual icehouse (NHER 25754). Ellingham Mill (NHER 10691), an 18th or 19th century building was a water-powered flour mill and may have stood on the same site as much earlier mills. It has now been converted into housing. It was near here that a piece of undated human skull (NHER 10682) was found in the river. 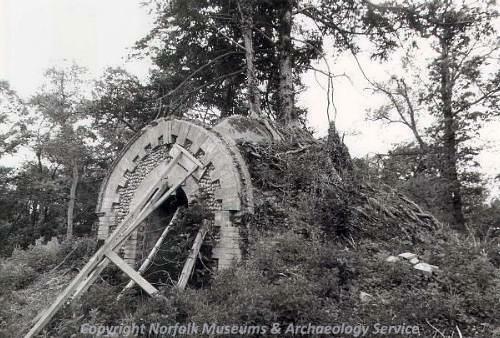 Not all post medieval buildings survive, however, and Ellingham’s two brick kilns (NHER 10681 and 15982) have now both been demolished as was the windmill (NHER 11678), which was built on a small mound. The small mound can still be seen as a slight earthwork on aerial photographs. Many post medieval metal finds have been recovered from the parish by metal detectorists, but one of the most interesting finds was made in a gravel washer that receives material from Ellingham and Gillingham gravel quarries. This was a possible Civil War weapon (NHER 25089). It was made of iron and was very rusty and so it was difficult to identify. The most modern archaeological site is a World War two pillbox (NHER 12668) that protected the bridge close to the church. Megan Dennis (NLA), 11th November 2005.
http://www.eng-h.gov.uk/archcom/projects/summarys/html97_8/1914.htm. Accessed: 17 February 2006.
http://www.norfolkmills.co.uk/Watermills/ellingham.html. Accessed: 17 February 2006.
http://www.norfolkmills.co.uk/Windmills/gt-ellingham-towermill.html. Accessed: 17 February 2006.